With hits included in their sets by bands such as The Killers, Stereophonics, Foo Fighters, The Arctic Monkeys, Kings Of Leon and Green Day, they provide a show that has proven extremely popular whatever the occasion. See what some of our customers thought by reading our Testimonials. 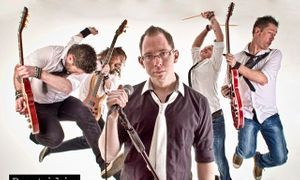 So, if you're looking for a band that creates an explosive energy with a full and totally live sound, playing modern, upbeat, and anthemic songs, then please feel free to contact us by clicking here, and we will be more than happy to discuss all of your requirements in more detail. In the meantime, if you would like to experience a live show prior to booking, then please click on our Gigs page to see where we are playing. Many thanks and we look forward to hearing from you soon.